It depends on the tool, of course. If you aren’t cranking out hundreds of dishes per night, you probably don’t need an industrial mixer or a commercial dishwasher. And while a $2500 coffee maker may be great if you’ve got money to burn, a $40 Chemex makes a cup that’s more than good enough for many high-end coffee shops, at about 1/63 the price. But a major investment in a very fine tool can be worth it for something that you’re likely to use every day for years on end. There is value in spending more up front if it means having something that you will enjoy using and won’t need to replace. This is one of the reasons that Le Creuset, for instance, commands $300 or more for a single enameled dutch oven, despite other manufacturers selling versions for $50 or even less. The quality of craftsmanship that goes into one means that it’s unlikely you’ll ever need to replace it, and they have a lifetime warranty to back that up. I’ve said elsewhere that finding a knife you like—one that makes cooking a pleasure—can be a highly personal matter. And frankly, making sure that the knife you have (whatever it is) is sharp enough has far more effect on whether the time you spend cooking is fun or frustrating. I’ve worked in food media for years, and I’ve had the chance to handle and learn about all kinds of knives, from the very inexpensive, to the very very expensive. But when I cook at home my go-to is still an old knife that I picked up years ago for a few dollars at a yard sale—it was made by a company called Hoffritz that went out of business, and it looks like this. It’s not a high-end knife, but none of the much more expensive knives I’ve owned has felt or worked better for me. Why? First, it’s well balanced: I can lay it on my finger right where the handle and blade meet, and it won’t tip or fall off. That makes it less likely that the handle feels like it’s going to slip out of my hand, even when I’m holding it loosely—meaning I can use to cut a lot of food without getting tired (or, you know, cutting myself). It’s also lighter than many higher-end knives, lacking the heavy sculpted handles or extra layers of metal that make high-end knives pretty, but often unwieldy and difficult to use. And while my knife is made from pretty standard stainless steel, it’s been relatively easy to sharpen, and holds an edge pretty well. But recently, a representative for a startup knife company called Artisan Revere reached out, and asked if I’d be interested in looking at one of their knives. What caught my eye was that their knife is made out of a new type of metal—Elmax steel—that is well known in the survival knife world, but hasn’t been used by a kitchen knife manufacturer before. According to a variety of sites, the steel is both more durable and harder (so it can get—and stay—sharper). I was skeptical, since as I understand it, you either have a knife that is durable, but won’t get extremely sharp (like many German-style knives), or have you one that can get very sharp (like many Japanese-style knives), but is more delicate and prone to chipping. And after about a month of testing, I am really impressed. The knife is basically an upgraded version of my favorite knife, that’s just slightly better in nearly every way. 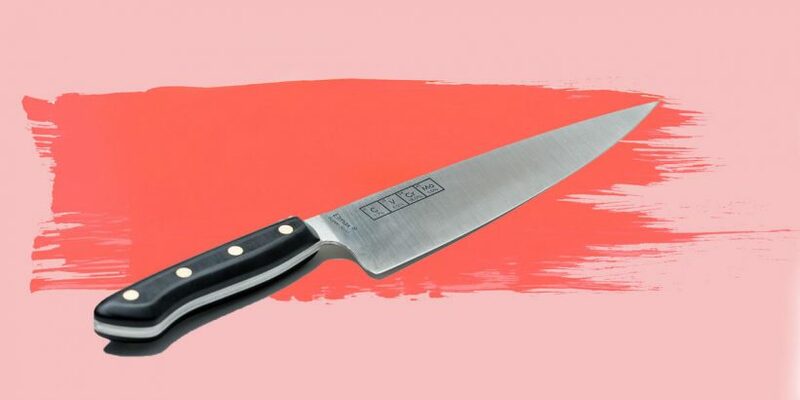 It’s not an impressive-looking knife—few guests in your kitchen would be likely to remark on it. This is, again, because it lacks all sorts of design features like a bolster (the flared-out chunk of metal behind the blade) a fancy handle, or the layers of extra metal that give some knives that wavy, Damascus steel, or hammered metal look. Instead it’s just a simple looking piece of metal, sharpened on one end, with an old-fashioned two-piece handle sandwiching the tail (or tang) of the knife. But everything about it is incredibly well made. Every single surface besides the blade is smooth and comfortable, from the well-polished handle to the top edge of the knife (which almost always has mildly sharp right angles). The balance is extremely even, so in the hand it feels light and easy to wield—more like an extension of your arm than anything else. And while two of our testers found a mild complaint with the comparatively long, thin blade’s point occasionally catching on a cutting board or other surface, others found it worked well for delicate work. For the next few days, Artisan Revere is selling their knives through Kickstarter for between $269 and $279. After this, they’ll be available on their website for closer to $400. If you’re in the market for a knife you want to use and love for years to come, this may be it.